Adobe’s 3D plans have come to light via a leaked agenda for the Adobe Max Conference in October 2010 by Adobe Flash Player engineer, Sebastian Marketsmueller. The agenda includes a presentation titled ‘Flash Player 3D future’ and the company is promising a deep dive into the next-generation 3D API. 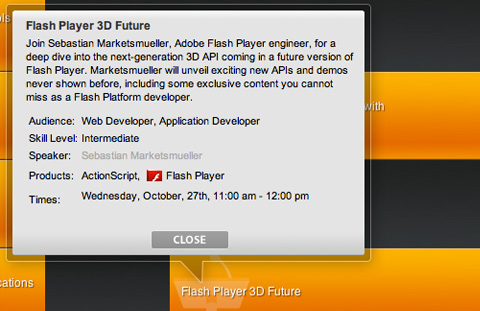 It was later confirmed by Flash Player product manager Imbert Thibault in a blog post. Adobe just released Flash 10.1 for Android based smartphones and the above news confirms that another new version of Flash is in the works as Thibault also said in his blog post that the 3D features will be seen “in a future version of the Flash Player.” This is highly encouraging and a major opportunity for 3D game developers, interactive websites and programmers. This might also mean users being able to watch 3D videos and movies online instead of buying expensive 3D TV sets or going to 3D equipped cinemas to enjoy a movie made in the technology. Apple doesn’t endorse Adobe Flash but Google sure does and after Flash 10.1, the next version of the software might bring 3D graphics to your smartphones and even to YouTube. So invest in some 3D glasses as the future sure seems getting out of the 2D zone. Fingers crossed.